Transient luminous events or TLE’s are electrical discharges which occur high above energetic thunderstorms. The term TLE is a broad term encompassing numerous different phenomena with some of the more common ones being sprites, blue jets, and elves. TLE’s were brought into the spot light in 1988 after researchers by accident imaged a number of sprites over the great planes. Since then much research has been done on this subject and many more TLE’s have been discovered. The reason it took so long for these relatives of lightning to be discovered is because they are very short lived (hence the name transient). We are talking in the order of less than 20ms or so for sprites, and on average sprites are only as bright as a third magnitude star. With this bit of information one can begin to realize the challenge at hand when it comes to TLE imaging! Sprites are associated with strong positive cloud to ground and intracloud lightning. They are mostly red in color due to the breakdown of the rarefied air high above the storm and the fact that nitrogen glows red when exited by low energy electrons in this type of discharge. The most effective way to image sprites is via the use of low light B/W ccd cameras. These B/W cameras fail to detect the red color of sprites but make up for this by being much more sensitive than color ccd imagers. Camera sensitivity is very important when imaging sprites because of their short life spans. For example, I use a Watec 902H camera which has a lux value of .002 at F1.4 and a frame rate of 25/sec. An F1.4 lens is near the threshold for imaging sprites. To improve on the total light gathering power of the lens the use of lower F-stop values is needed. 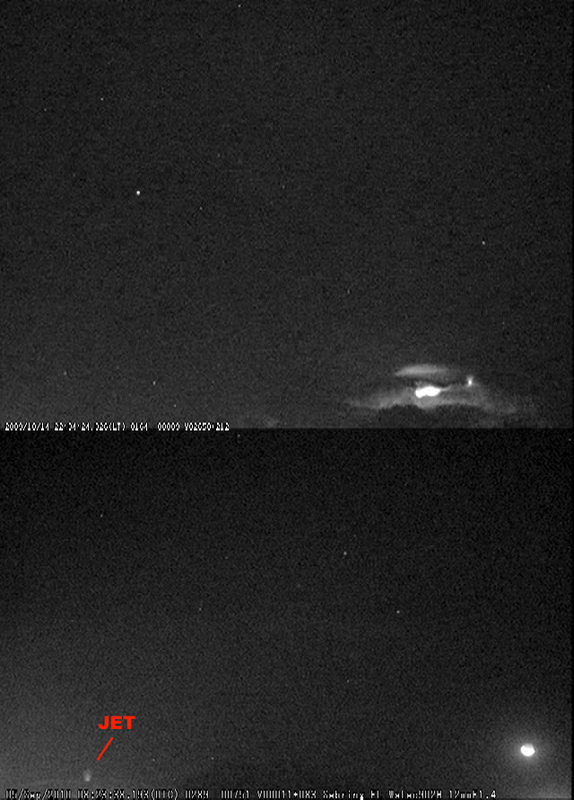 The example image to the left was taken with an F1.2 12mm lens, and as can be seen the sprite is a little over exposed in the brightest sections. This lens lowers the lux value of the camera enough points to make it plenty sensitive enough for TLE detection. I’m a VLF enthusiast and my goal for this project, besides optically imaging TLE’s, was to detect sprite induced VLF disturbances on VLF transmitters and VLF audio signatures. My experience with the VLF portion of this project is documented in my SID Receiver page. I will cover my experience with the imaging side of this project here. I first started experimenting with sprite detection using my modified Logitech QC Pro 3000. It didn’t take long before I realized that the QC Pro 3000 is just not sensitive enough for this sort of work. Sure I can run long exposures with this camera and manage to detect 6th magnitude stars after 5 seconds of exposure, but what you need is this level of sensitivity with 1/50sec exposure rates! It didn’t help that I was using less than adequate lenses on the webcam as CS mount lenses were out of the question (no way to mount them to the webcam). I then got serious and purchased a Watec 902H 1/2″ CCD camera. These cameras are well regarded in sprite research and can be purchased used for very reasonable prices. The Watec 902H outputs an analog interlaced signal that can be acquired by a PCI or USB CCTV PC card. I use a Conexant PCI four channel card and connect the camera to it via a 50 foot double shielded coax cable. A separate well regulated 12V power supply which can deliver at least 250mA rounds out the camera setup. As can be seen on the right I placed the camera in an outdoor surveillance camera enclosure and placed it about 25 feet off the ground atop an antenna rotor for Az control . In addition, I am using another rotor for elevation control. This setup allows for full control of the camera orientation. This is very important when using higher focal lengths like 16mm lenses for example. With higher focal lengths it’s possible to get more detail from TLE’s, but pointing of the camera becomes critical. This setup solves this problem. For the lens side of things I’m currently using a Computar 12mm F1.4 1/2″ CS mount lens. Ideally one would use an F0.8 lens for sprite imaging, but the 902H doesn’t have enough room between the ccd and the lens for the corrective lens needed when using F0.8 lenses. So I have settled on an F1.4 lens which seems to work fine. I have spoken with a researcher in this field and he has told me that he recommends F1.2 or F1.4 lenses for the Watec 902H. He has noticed that F0.8 lenses tend to over expose sprites with this camera. The Watec 902H is a very sensitive camera. I am impressed with its low light sensitivity and as such want to share an example. Here is a stacked image I took of the Taurus region using a 16mm F1.4 lens with the camera pointed almost on the vertical. Stars down to magnitude 7.3 can be discerned in this image. The star cluster towards the top of the image is the Pleiades and the Hyades are in the bottom right corner. North is to the left. This image was taken at a 1/60 second exposure rate! 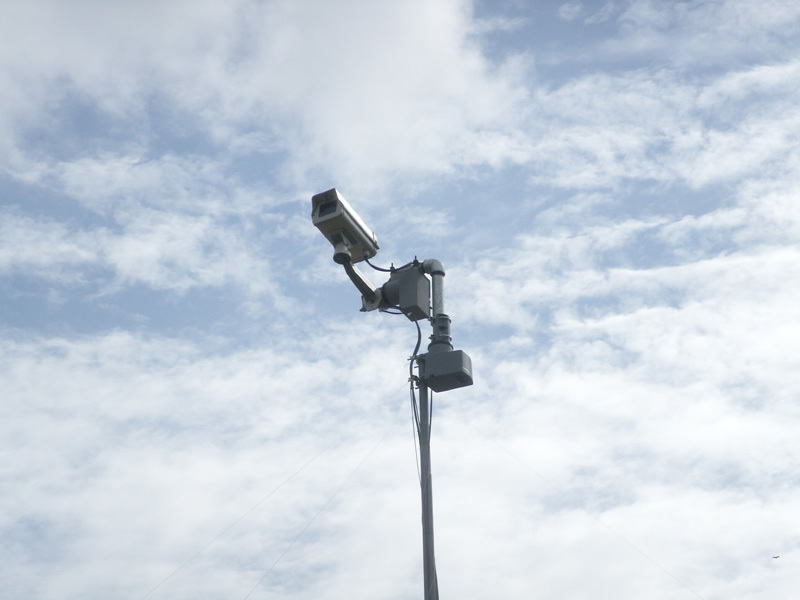 Installing a highly sensitive low light camera outside is only half of the problem. Sprites and other TLE’s don’t happen all the time so we need to monitor storms for many hours in the hopes of catching some activity over the storm. Simply recording hours of boring dimness with the occasional lightning flash and then analyzing all of this would be a tedious task indeed. Thankfully there are some great software applications out there that make this part easy. 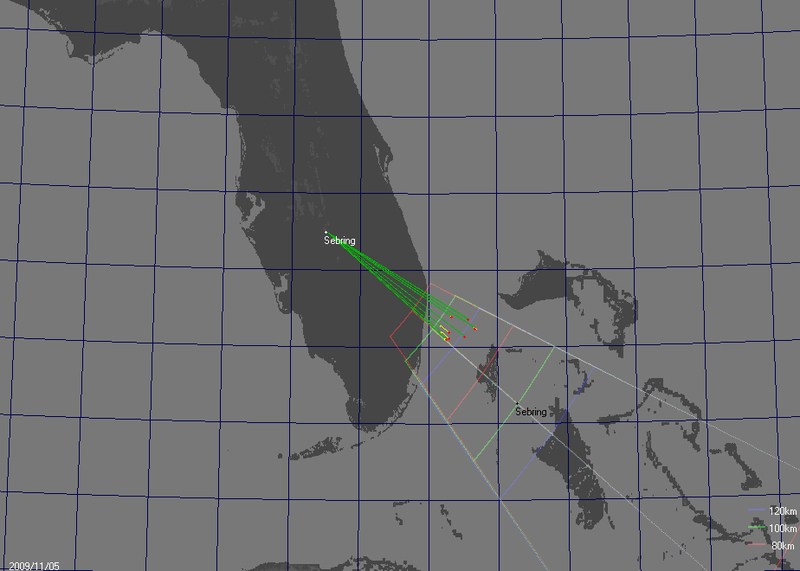 I use UFOCapture and in my opinion this program is one of the best ones out there for TLE and meteor work! So it is worth the money. I set UFOCapture to monitor a region of the sky all night and the next morning I simply go down the list of captured clips looking for sprites or other interesting captures. I also run my VLF receiver into the audio channel of UFOCapture for my VLF audio signature work. Here is an example of what to expect from a setup like mine. This sprite group occurred on Oct 16, 2009 in the Atlantic over a storm about 150 miles away. Around the upper region of the sprites is a bright halo. Also tendrils can be seen below the main sprite bodies reaching many miles downward, but not getting near the thunderstorm top. One characteristic of sprites is that they don’t reach the cloud tops from which they were generated. 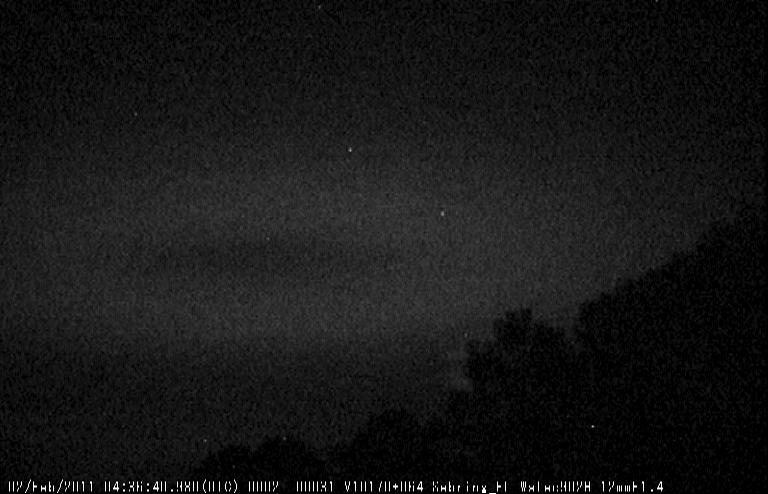 The lightning flash which produced this sprite is clearly visible behind the tree line. This image has been de-interlaced in Adobe Photoshop. SonotaCo also provides UFOAnalyzer which is a great application for measuring the distance to and location of sprites (among other things). When used with only one station the results are not very accurate, but it’s ok for rough amateur work. 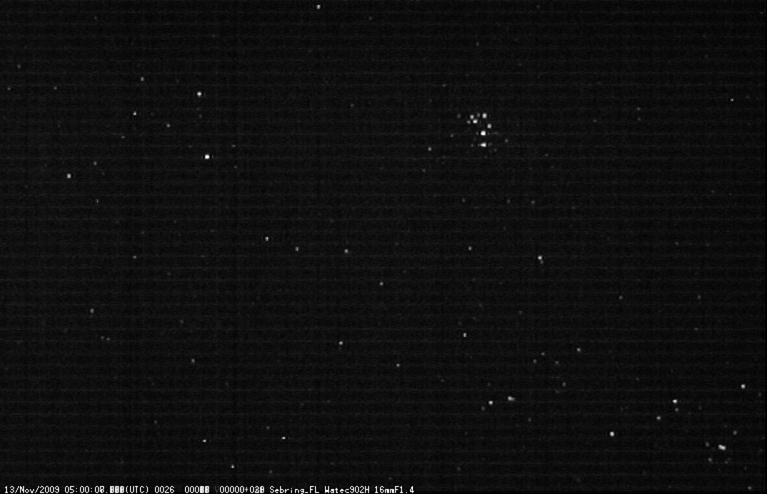 Here is another sprite group taken on Nov 5, 2009 on which I used UFOAnalyzer to calculate the distance to each sprite from my viewing location. From the below image it looks like the sprites occurred in a circular pattern. After measuring the distance to each column sprite within UFOAnalyzer I plotted the locations on the ground plot window below. This plot reinforced the circular pattern seen on the image. To confirm that the distance measurements made in UFOAnalyzer were accurate I compared them with a satellite image for that time. 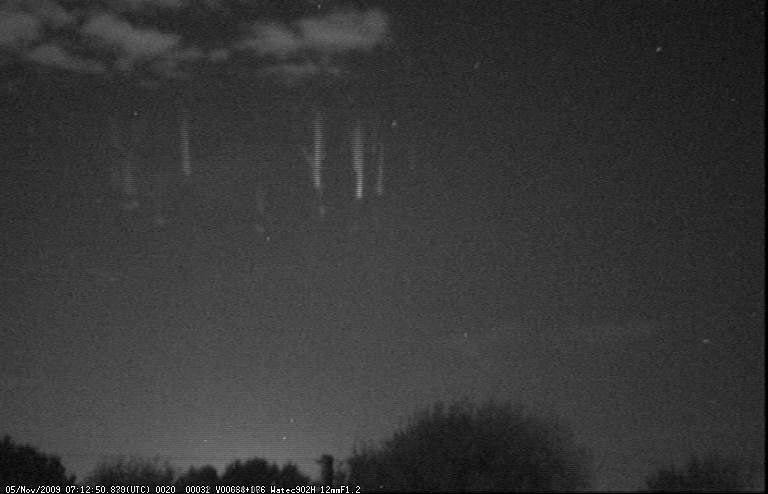 The sprites occurred at 0712UTC. 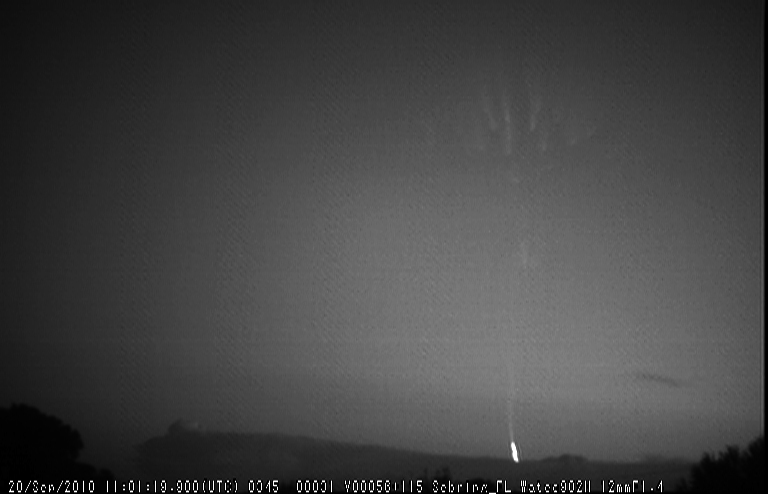 As can be seen, the thunderstorm that caused the sprites was precisely where UFOanalyzer calculated it should be. Another type of TLE that can be imaged above storms is the blue jet. Blue jets are different from sprites in that they protrude from the tops of cumulonimbus thunderstorm cloud tops. 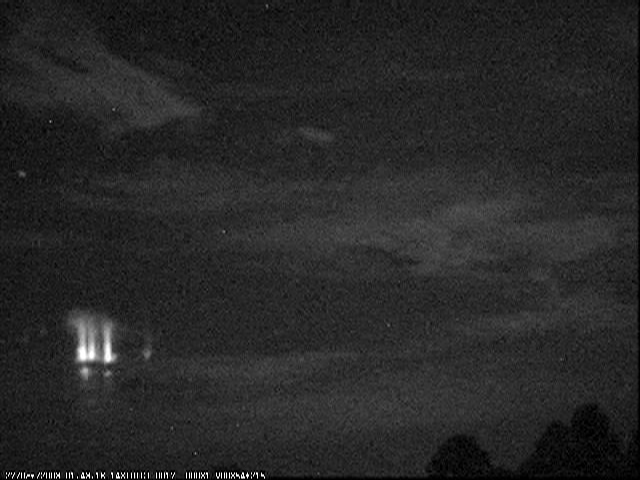 Sprites don’t reach down to the cloud tops, only down to about 40 km. Blue jets get their name from the fact that in color video they are blue and their shape is that of a narrow cone that propagates at a high speed (approximately 120 km/s). The color is believed to be due to a set of blue and near-ultraviolet emission lines from neutral and ionized molecular nitrogen. Blue jets can reach up to the lowest levels of the ionosphere (40-50km). An excellent video of blue jets can be found here. A closely related phenomena to blue jets are blue starters. Blue starters are believed to be blue jets that don’t quite make it. 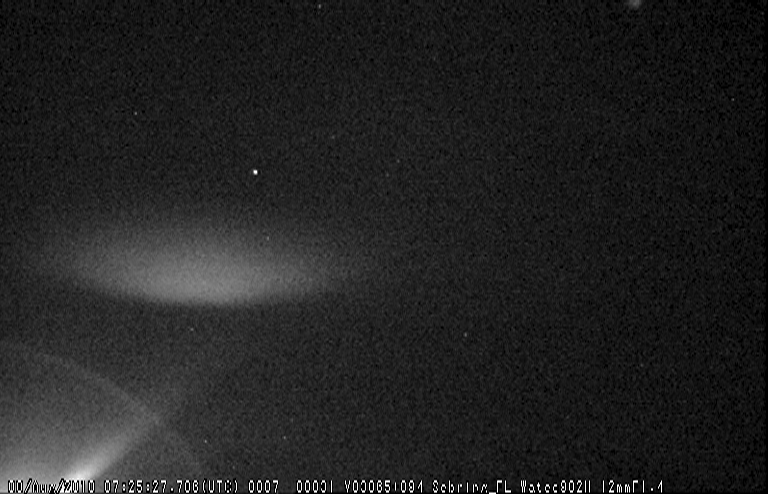 Below is an example of a possible blue starter which I imaged on Oct 14, 2009. The storm was about 70 miles away and was very energetic. To the right is a bright “jet” like protrusion that could very well be a blue starter (labeled red). Blue jets and blue starters are rare, most likely because since they are blue in color most of their light gets filtered out by the atmosphere at large distances. It’s possible that this “jet” reached higher than the image shows, but due to the great distance (70 miles) all but the brightest sections reached my location. Click on the image to get another blue jet/starter example from Sep, 05 2010 as well. Gigantic jets are upper atmospheric discharges which effectively create an electrical connection between the top of a thunderstorm and the bottom of the ionosphere. This characteristic of gigantic jets has strong implications for the global electric circuit and such is a hot research area in the atmospheric science circles. My primary goal for installing the TLE observatory was to capture a high quality video of a gigantic jet. I wanted in some way to contribute to the TLE research effort. Capturing video of a rare gigantic jet is a great way for amateur stations to assist in this research effort. 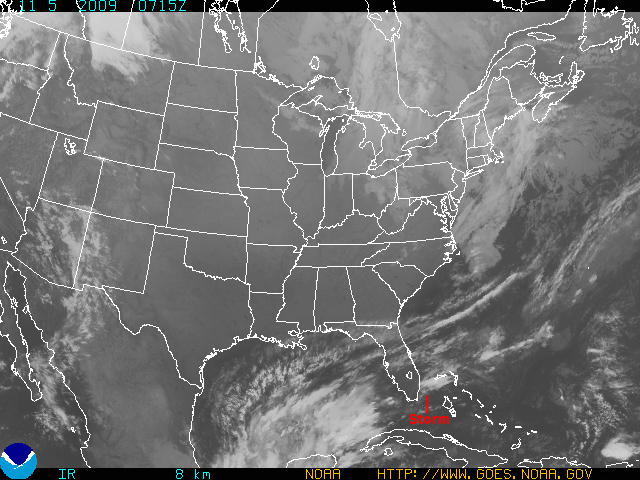 On September 28, 2010 I succeeded in imaging a gigantic jet off the coast of the Kennedy Space Center. This gigantic jet occurred during daylight (7:01 a.m. local) and is the first ever imaged during the day. Because it occurred during the day a lot of detail was lost in the video. Nevertheless all of the gigantic jet components are visible. This jet reached up to around 80km in height. The thunderstorm cloud tops from which the jet originated were around 16km high. Click here to watch the video of the event. The scientific community is actively researching this event. The gigantic jet occurred near a number of professional research sensors! Elves are another TLE which live at the lowest regions of the ionosphere above 95 kilometers. They most likely result when an EMP (energetic electromagnetic pulse) propagates through the ionospherecausing a region of up to around 500km to glow red. Elves are very short lived (~1ms) so they are very difficult to detect with standard 17ms or 33ms temporal resolution video equipment. Here is my first capture of an elve. Elves can be identified by their donut shape and as can be seen here the area covered by this elve is immense! 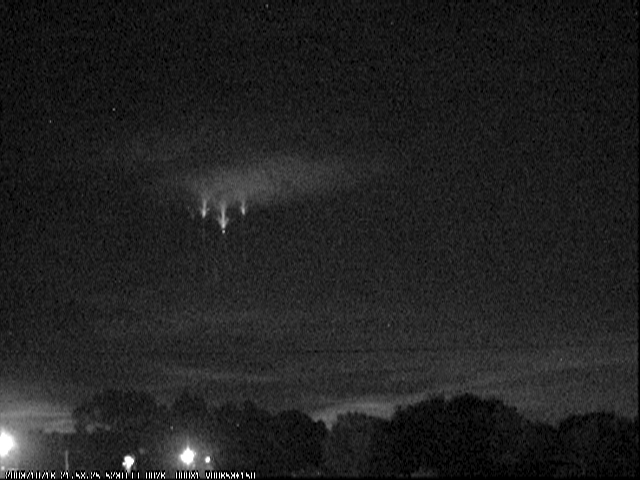 Halos are another similar phenomena which are more closely related to sprites and are thought to be associated with electrical breakdown in sprites due to the thundercloud quasi-electrostatic (QE) field. Halos are more easily detected with my equipment and I’ve captured numerous which look like the one below. The glow in the corner of the image is from a street lamp. Thanks for reading, and please email me if you have any questions.